Few scientific breakthroughs of the past century have had as big an impact as the development of electronics and computer related technology: starting with the gigantic prototype computers that occupied several rooms, and then becoming the modern mobile devices that can fit in our pockets. This boom resulted from many technological advancements, as scientists and engineers learned to control electrical signals using transistors and then to integrate this technology into computer’s processors. These advances have led to computers that are more powerful, energy efficient and cheaper. Moore’s Law summarizes these technological advances, showing that the number of transistors in micro-processors doubles every two years. Empirically, as the number of transistors per micro-processor increases, the size of transistors tends to decrease. Eventually, the components of a computer become small enough that extraordinary physical effects emerge, and smaller versions of the same transistor designs no longer work the same way. So, what is next? Size reduction seems like a limiting barrier at first, but the effects that emerge have sparked a strong interest in the scientific community to understand if these effects can be used to increase computational power in a different way. The current generation of computing treats information ‘classically’, namely as binary values (or ‘states’) of 0 or 1. The signals are then encoded physically in the form of electric pulses or magnetization patterns. Those basic units of information are usually referred as ‘bits’ and are the basis of the modern digital technology. In this way, storage, data transfer, and processing only makes use of classical physics. On the other hand, phenomena like those that emerge when transistors shrink are actually a subset of a different class of physics that we began to understand in the past century: quantum mechanics. Many exotic, seemingly reality-defying effects are observed in microscopic, well-isolated systems, such as the dual wave-particle behaviour in atoms or light. These phenomena are usually unobserved because, as the size of systems increase, noise associated with environmental perturbations increases and can wash-out the quantum nature of the phenomena, leading to the ‘classical’ appearance of reality. Quantum systems need to be carefully isolated from the environment to maintain their quantum properties. Nevertheless, these quantum properties may provide a different way to increase computational power. Bloch Sphere. A qubit can be represented as an arrow pointing to some point on the Bloch sphere’s surface. The position of the point determines the properties of the qubit. Any information we want to process has to be encoded in a physical system. Therefore, we might ask: what are the new resources and possibilities available to us if information is encoded in a quantum system? In quantum mechanics, possible physical states include the combination of 0 and 1; this is called superposition. The basic unit of information using such states is known as a ‘qubit’. We can visualize a qubit as a point on a sphere’s surface, where the south-pole is the qubit equivalent of the classical 0, and the north-pole the classical 1. A system can occupy any point on such a sphere, but the majority of points are unstable and cannot be determined by a given measurement needed to extract the information from the qubit. 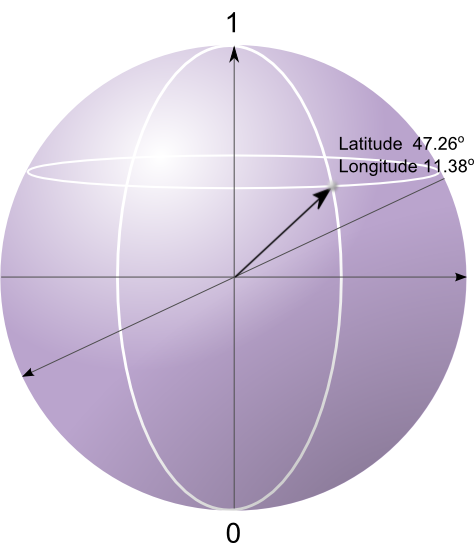 A quantum measurement can be performed along an axis oriented in any direction through the center of a sphere in contrast to classical measurements that only measure in the North-South direction. However, the outcome of a quantum measurement can still only distinguish between the two ends of the measurement axis. The outcome is random, and the probability of each outcome depends on the relative position of the qubit in this surface with respect to the measurement direction. This randomness seems to restrict the way we can make use of the qubits for doing computation but, if we prepare the systems properly and choose what measurements to make wisely, computation with qubits can be done. Things get even more interesting once we have more than one qubit to play with. Now, states where the two qubits are ‘entangled’ become physically allowed. ‘Entanglement’ occurs when a measurement of one part of the system reveals the state of the other part, even if the measurement of each individual part appears completely random. The information is in the relation of the pair, not in either single qubit inside the pair. There is no analogue in classical systems that shows this type of behavior. Physicists have learned that entanglement is a rich resource for quantum information processing. These ideas and possibilities are the foundation on which physicists and computer scientists build algorithms using quantum states to do computation beyond what is possible for a classical computer. Nowadays, theoretical physicists and mathematicians have a reasonable understanding of what problems can be solved with the help of a quantum computer. We can think about the power of a quantum computer this way: The state of a single qubit is described by longitude and latitude numbers on a sphere. Due to entanglement, every such number can be related to every other number of another qubit, so the information contained in the qubits is not just each number but all of their products with one another, for two qubits it becomes 4 numbers, and for three we have 8. If we have a collection of 300 qubits, we need to keep track of 2^(300) numbers to describe the system. If we were to describe the same number of correlations in a classical way, we would need to have more classical bits than there are atoms in the known universe! Richard Feynman was one of the first to envision the power of quantum computation in this way. Few qubits can contain a lot of information, making it possible for a quantum computer to handle tasks impossible for even the best classical ones, such as factoring very large numbers, or searching for entries in very large unsorted databases. For example, factoring a 300-digit number would take a hundred thousand years using a classical algorithm on a desktop computer, but only one second using a quantum computer. Isn’t that amazing? Many different systems can be used as qubits. 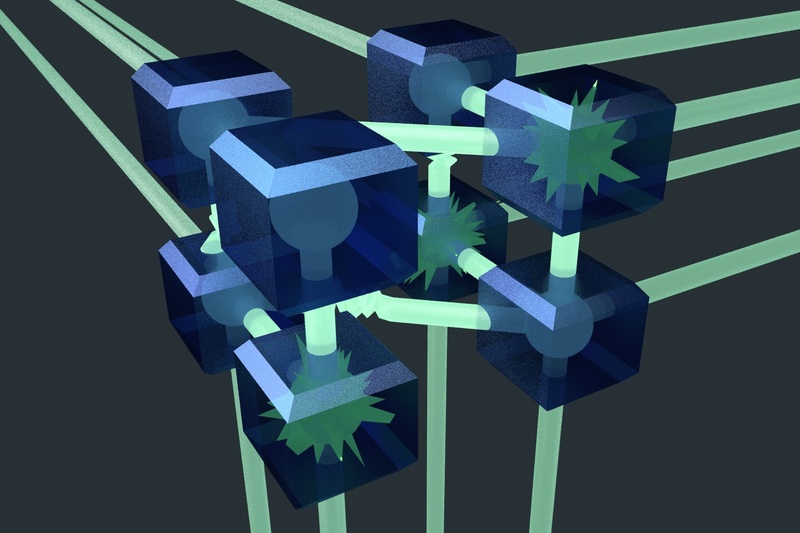 (a) Different states of superconducting elements can be represented as qubits, for example flux qubits, and can be integrated into more complicated circuits. (b) Lasers and magnetic fields can be used to control internal states of atoms, that can represent a qubit. In the left inset, entanglement between 4 atomic ensembles (few million Cesium atoms at 150 microKelvin temperatures) was demonstrated. (c) Single or multiple ions can be trapped using electrical fields. 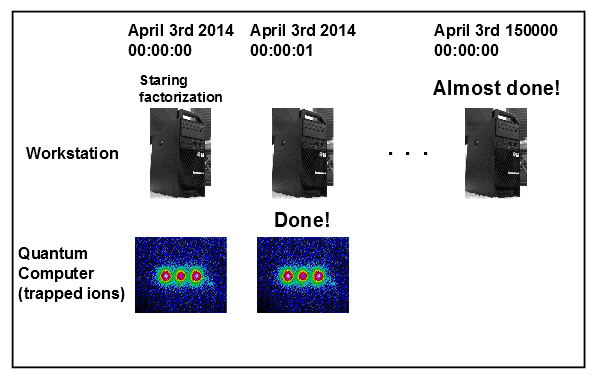 In the lower inset, processed fluorescent light from 3 Beryllium ions can be observed. Source: NIST, JQI, JPL-Caltech, Caltech, Wiki commons. While quantum computing promises great things, one big question is: what will qubits be? We have already mentioned that classical bits can be represented, for example, as electrical pulses. On the other hand, nature has provided us with many physical systems as qubit candidates. Over the past 30 years, physicists have explored a plethora of possible systems, including the up/down spin states of particles, photons states, superconducting systems and the states of certain neutral or ionized atoms. These systems with their abundant phenomena are being actively studied and experimented with by many research groups around the world. Harnessing these systems to build a modular quantum computer remains very difficult, partly because quantum states are very fragile. Quantum internet. Qubits can store information at certain nodes where different control techniques can be applied to process this information. Channels provide communication among boxes. To protect the information from noise on the nodes and channels, we need to have an exquisite control over the experiment. 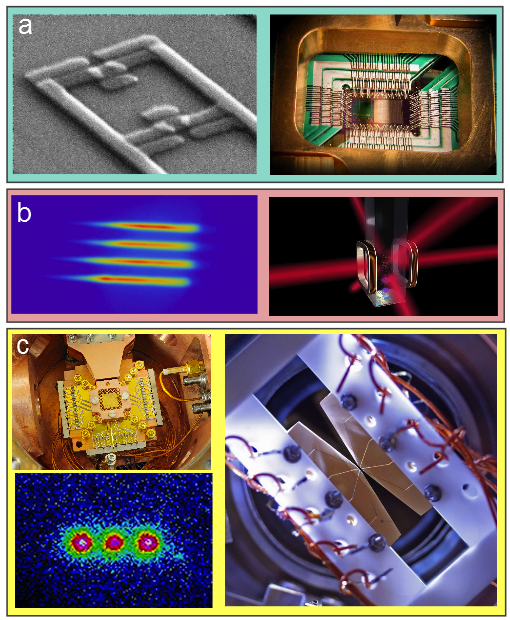 Nevertheless, scientists are exploring many different avenues of quantum computing. One very exciting idea is to build a quantum internet, where quantum systems with qubit storage and processing capabilities communicate through high fidelity channels and the transferred information is well-preserved. Others have proposed to use quantum computers to analyze big data sets such as those produced in the Large Hadron Collider (LHC) experiments. A different focus is to use well-understood and controllable quantum systems to simulate other physical systems that might behave in a similar way, but will be very difficult to simulate in a classical computer, for example superconductors. The experimental and theoretical advances have been remarkable so far, with consequences reaching from cosmology to microscopic systems. The challenge is set: let’s transition to quantum computing! Juan Andrés Muniz is a 2011 fellow of the Fulbright Science & Technology Award, from Uruguay, and a PhD Student in Physics at California Institute of Technology. Su-Peng Yu is a 2011 fellow of the Fulbright Science & Technology Award, from Taiwan, and a PhD Student in Physics at California Institute of Technology.